If you come up with circit you need a PCB made for, my mate can do fantastic PCBs. Hi there Lance how did you do that .... ? Had the motor connected to two batteries to give 24v and whilst it was rotating (6000'ish rpm) grabed the gear with a tea towel to induce some resistance (i.e. strain on the motor / gearbox). This must of cause heat and friction that melted the gear and also the tea towel has holes in it. Must admit lance, that is quite an impressive cooking skill you have! Hope you can get back up and running. In regard to brakes, I am using standard at the moment. In regard to yours sticking, check that you have not lost the little cir-clip that holds the pin in position. I had a similar issue once. Send a photo of your assemble we may be able to advise from the photo. 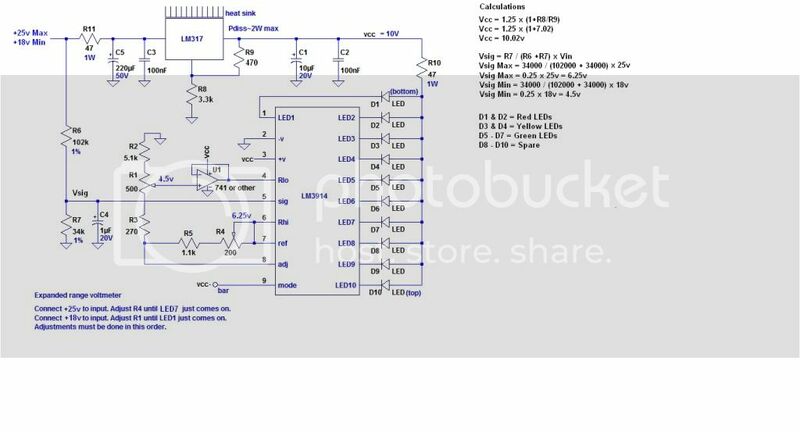 Hi POD11, I think I have a circuit that will do both the 24v battery monitor and the current using two LM3914 IC's. I am not about much this coming week, but got some leave the week after. I have the 24v 5 LED display from 4QD. It is using a number of BC556B amplifier transistors and 2.2k resistors with volt steps of 0.5v. By looking at the LM3914 we can drive up 10 LED but will do just the 7 LED as per the POD. Diagram below shows the proposed 1st part of the circuit. (its been +20 years since my HND course). Just a question, i have been looking at the qd controllers, whats the best one to get that would be suited to the c5 MOTOR RUNNING AT 24V ?? Hi POD11, I have ordered the Uni8 24 with cover, the twist throttle, matching handle and 5 LED battery monitor (but only got it to see what it was like) - £130. I understand Chas used the same on his. Test PCB is being made as i speak using the circuit lancelot put on here, (with a few modifications). Looks like that side of things is nearly complete, my mate is looking using the LED strips from the OLD pod as they have the bezel around them. He is still working on the "current" part of the display, but has suggested a use for the LED strip on the left, maybe using the Yellows at each end for the indicators, and using the other leds for indications for the fan running (if switched) any other suggestions for the use of these leds ? Will get some pics of the prototype when i next pop round to see him. He has asked how many people might want these ?? No price as yet, but will get some sort of idea once the final board is completed. Any more info on the circuit.